Sometimes, the simplest dishes make both the most comforting and the most nourishing meal. Making a simple dish with the highest quality ingredients and utmost care will make all the difference in the final product. Therefore, when selecting produce for even the most basic dishes, it’s really important to get the good stuff. Try your local farmers market and even roadside produce stands if you have any in your area. If you are shopping at the grocery store, look for the certified organic veggies and hormone-free organic meat, fish and poultry. Although it may be a little more expensive it’s worth it. Besides being organic, it’s also key that your ingredients are appealing to your senses. Smell, touch and taste everything you are putting in your meal. This separates a good cook from a great one, and adds a sense of ownership and unrivalled pride. Knowing that you lovingly selected each and every carrot in the soup will give you a deep respect for your meal. Carefully preparing the ingredients in a patient and ritualistic manner can be complete bliss for some. The smells and sounds of the kitchen meld together to create a culinary nirvana in your own home. 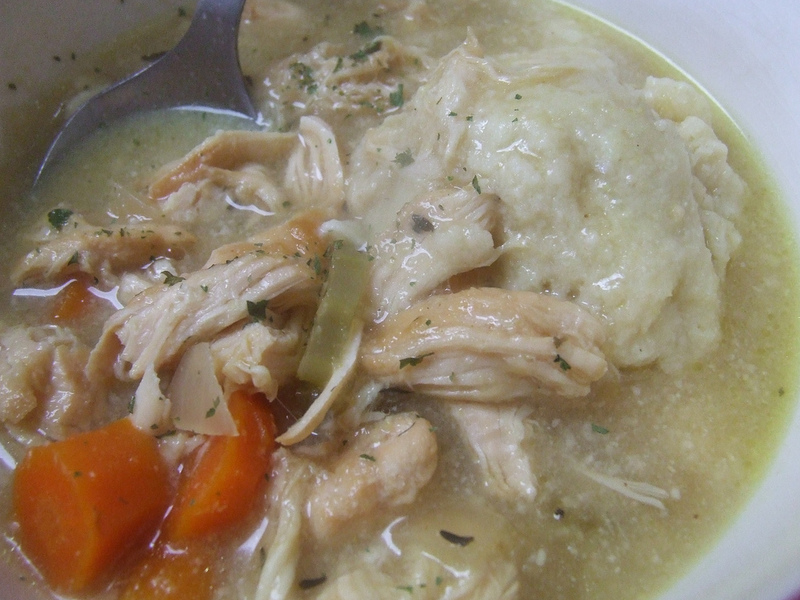 The following Chicken and Dumplings recipe is from my childhood and has always been a go-to for colds or warming up after a cold winter outing. Although it’s a fairly involved recipe, it gets easier the more you make it, and it is definitely worth it. You may want to make a double batch. We tend to go through a pot easily at my house. For those of you that are vegetarian or vegan, there is an alternative recipe noted with an asterisk (*) for you to follow. For our gluten free friends try rice, corn, or any kind of gluten free flour you like. And, of course, as with any recipe, feel free to “color outside of the lines” and make it the way you like it. Enjoy! Tags: Barley's Taproom and Pizzeria, C-MOR, Central Virginia Legal Aid Society, Chicken and Dumplings, Children's Museum of Richmond, comfort food, Farm Tour & Lunch, food, Food For All, Foodie Friday, Okanogan County Community Action Council, Okanogan High School, Patrick Nelson, Rebuilding Together*Tri-Cities, recipe, Slow Food North Louisiana, Snow Day: A CAC Beardsley Community Farm Benefit, soup, Soup and Bread Dinner 2014, Soup's On 2014, Souper Bowl II, The Hullabaloos, Tully Dolci, Weirauch Creamery, winter.